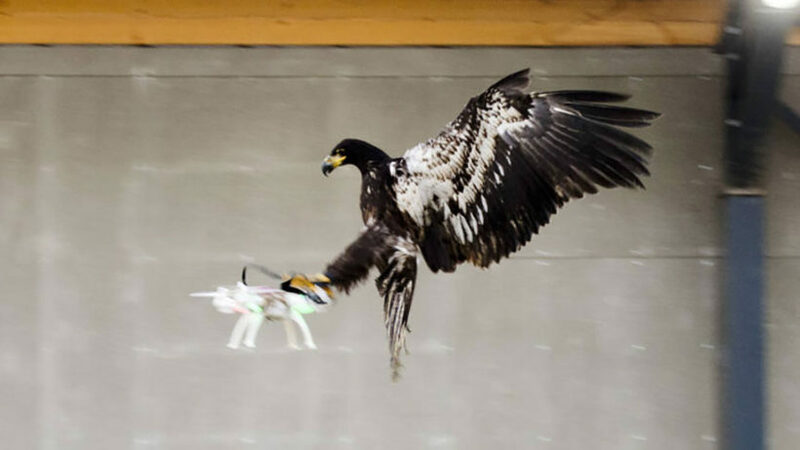 The Dutch National Police have trained an eagle to take down Unmanned Aerial Vehicles (UAVs), as revealed in a video posted to YouTube Sunday. A quadcopter drone that crashed onto the White House grounds last year highlighted the growing security threat posed by small UAVs. The White House incident came less than two weeks after a drone flew over the French presidential palace in Paris. Drones, thanks to their small size and ability to hover low over the ground, can pose a huge security headache, experts have warned. Technologies touted to combat UAVs include a new breed of ‘interceptor’ drones. Michigan Tech University, for example, has developed an anti-UAV octocopter that uses a net to disable smaller drones. The US military is also ramping up its anti-drone efforts. In 2014, for example, the Office of Naval Research announced plans to build a laser weapon to shoot down drones. Last year Boeing demonstrated a laser cannon that could be used to destroy drones. French risks being reduced to the language of “text messaging” when rules to simplify the language take effect in primary school textbooks, linguistic purists have warned. Guardians of traditional French spelling have expressed outrage at changes in spelling that will allow pupils to do away with the circumflex hat (ˆ) that sits on top of certain vowels and other “useless” letters found in 2,400 words. The changes, which will come into effect in new primary school textbooks at the start of the school year in September, mean the circumflex on “i” and “u” will become optional for many words, so that “maîtresse” (mistress) can now be written “maitresse”, and coût (cost) can be written “cout”.. Letters that have no phonetic or semantic usage are also for the chop, such as onion, which can now be spelled “ognon” as well as the traditional “oignon”, or imbécillité (imbecility), which can lose an “l” to be spelled “imbécilité”. The new rules also remove hyphens from some words, making “le weekend” acceptable instead of the traditional “le week-end”, and allow pupils to write “nénufar” (water lily) instead of “nénuphar”. 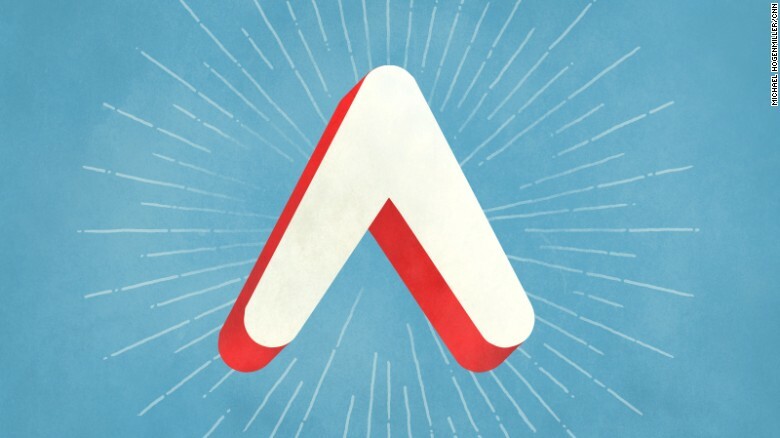 The changes, which have caused uproar on social media, were first approved by the prestigious guardians of the French language, the Academie Française, in 1990. Since then both versions have been considered acceptable, but the new spellings only began appearing in official documents in the past few years. Now, the new school teaching curricula has pronounced the 1990 changes the gold standard for teaching spelling. The circumflex is “one of the main causes of errors and its usage is random”, said a website setting out the changes. But they appalled scores of social media users, prompting the creation of the hashtag #JeSuisCirconflexe (I am circumflex) – in reference to the Je Suis Charlie tag that went viral after the attack on Charlie Hebdo last year. One person even put up their computer circumflex key for auction on eBay with a starting price of 99 centimes. The UNI teachers’ union launched a petition, warning that it will “result in the veritable dumbing down of the French language to make it resemble phonetic or even phone text writing”. “Do we remove the dates of French history on the pretext they’re not easy to remember? No!,” wrote Julien Soulié, a classics teacher. Reformists said the whole row was a storm in a teacup as the changes were recommendations and optional, and that the French language has changed many times over the centuries. “Change is part of the life of a language; it doesn’t disfigure it,” Delphine Guichard, a teacher in the Loiret area told Le Parisien. Edouard Trouillez, a lexicographer, said he was convinced that the circumflex with “no semantic value” will “stop being used” in the long term, pointing out that in the 18th century, it was often used as a stop-gap way of removing an “s”, such as turning “forest” into “forêt”. Rue89 website cited Michel Masson, a Paris French professor who compiled a report on the proposed changes a decade ago and branded defenders of the linguistic status quo philistines. “I am dependent on social media myself. 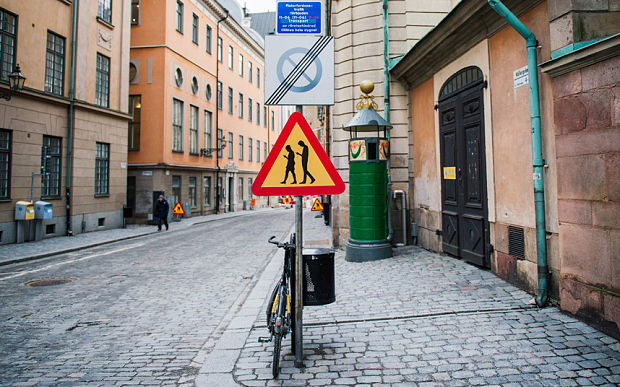 And one day on my way to work I was almost run over because I was staring at my phone like a sick person,” Jacob Sempler, who created the signs with his colleague Emil Tiisman, told The Local. Others noted that it was a problem around the world. “Glad to see this is not only happening in America,” tweeted Richard Gersten. Mr Sempler agreed the problem was not unique to Sweden. “You can see it all over the world. If you’re out walking in any city at all these days, you see people completely glued to their phones. It’s rather tragicomical, really, that social media in many ways have made us less social,” he told the newspaper. The signs are not the first attempt to tackle the issue. 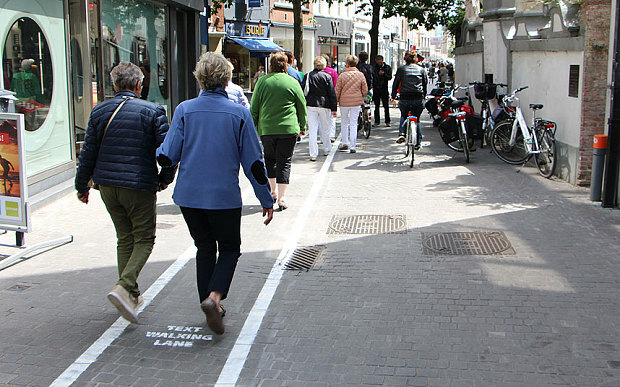 In Belgium, Antwerp has given smartphone users their own designated lanes, where they can walk while looking at their mobiles without annoying or endangering others. However, a study last year found smartphone users might not be as oblivious to their surroundings as some might think. Academics at the University of Bath and Texas, US, found that texting causes people to slow their pace and make large, exaggerated movements to negotiate crowds and compensate for their diminished vision. Dubbed the “protective shuffle”, it did not seem to work for radio researcher Laura Safe who was videoed walking into the Birmingham canal while texting. As well as endangering pedestrians, smartphones are also causing health problems, according to the British Chiropractic Association. It has found a rise in the number of young people with back problems, as the amount of time spent leaning over small phone screens can put spinal discs under pressure.